The CURE Thrift Shop is a non-profit vintage shop in Manhattan, New York's East Village benefiting type 1 diabetes research & advocacy. The CURE Thrift Shop is a non-profit vintage shop in Manhattan’s East Village benefiting type 1 diabetes research & advocacy. 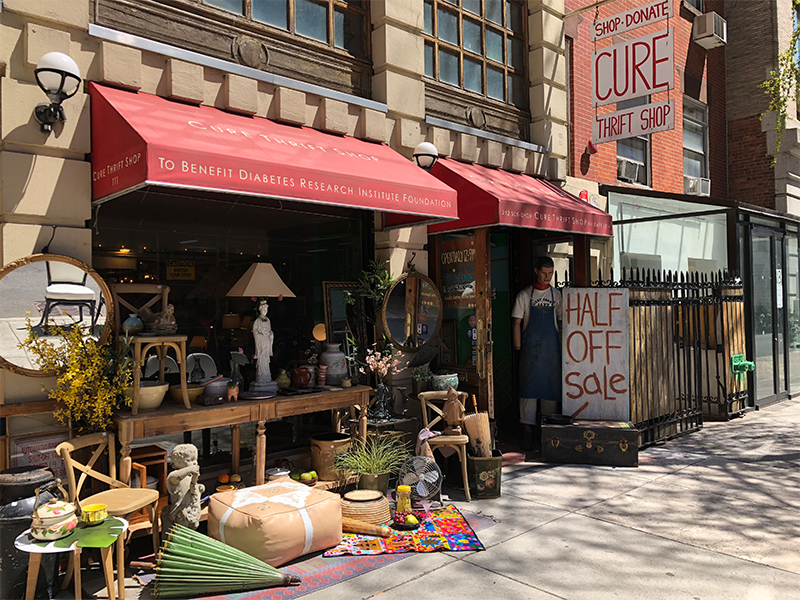 Liz Wolff opened the popular shop in 2008, and since that time it has been lauded as one of the best thrift shops in New York. The shop is devoted to vintage furniture, jewellery, and art as well as racks for coats, skirts, jeans and so much more. For loyal thrifters, and for those in search of a one-of-a-kind treasure, Liz’s shop is a must visit. We had a chance to speak to Liz about type 1 diabetes, her life and of course, her fantastic shop. When you were diagnosed with diabetes and as you grew up attending high school and college, did you think you would become an advocate for type 1 diabetes? 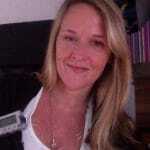 I was diagnosed with type 1 diabetes when I was 11 years old. When I was first diagnosed, I was abnormally fine and accepting of my new life with type 1. From my second injection of insulin that I administered on my own, I was in complete control of the disease. Fast forward two years and I had quickly become a teenager who was about to enter high school. I had discovered diabulemia (although I didn’t have a name for it at the time) and fell into a 10-year roller coaster of very poor diabetes control. I was in complete denial about having a serious condition that needed attention. I hardly ever tested my blood sugar and guessed bolus amounts based on how I felt. I was the poster child for “non-compliant” type 1 diabetes and I never in a million years thought that I would ever become an advocate for my disease. When did you decide to open up the CURE Thrift Shop? I had “dropped in” to Hunter college for 3 semesters, but decided that college was not for me. Instead, I landed retail management jobs and was selling items on eBay that I picked off of the curbs of the luxurious Upper East Side in Manhattan, New York or bought at garage sales and thrift shops. My eBay business was booming and soon I had family members, friends, and neighbours asking me to sell their stuff for them. My husband, Marty and I got married in 2005 when we were both 21 years old. I desperately wanted to open an actual store, but Marty was about to start medical school and we needed a bit more financial security at that time. I took a management job at a large non-profit thrift shop so that I could learn the business while earning an income. Two years later, I decided to open my own non-profit to benefit type 1 diabetes research. It took a year of planning and we opened in July 2008 when I was 24 years old. Did you have to explain to people why type 1 diabetes has not been cured? I try to keep my cool and explain what type 1 diabetes is and why we don’t have a cure yet, but I’ve learned that most people who make comments like that aren’t looking for an education. What is the strangest thing you have ever received? The strangest item that we have ever received was a gun that was concealed in a book. A man had passed away and his girlfriend donated the contents of his apartment to us. Of course, I turned the gun in to the police, but was questioned for a while. What types of research does CURE Thrift shop fund? Cure has contributed hundreds of thousands of dollars to various type 1 diabetes causes throughout the ten years that we’ve been operating. About five years ago, I decided to not only fund type 1 diabetes research, but to give to advocacy and awareness organizations as well. As much as I want a cure for type 1 diabetes, I also want to make sure that I am helping those who are currently living – and struggling with diabetes. We currently donate the majority of our funds to Marjorie’s Fund. How do you define success? How has type 1 diabetes played a role in your creative business and life? I define success by joy and good health in my everyday life. My desire to open Cure Thrift Shop and to be a role model for people living with type 1 diabetes is what led me to finally get in control of my disease. The shop has become my identity and I truly believe that Cure saved and shaped my life in every way possible. Thank you, Liz, for sharing your story and for your commitment to type 1 diabetes. 111 East 12th Street, New York, NY 10003. My desire to be a role model for people living with type 1 diabetes is what led me to finally get in control of my disease.